Outfitting a first home can be a real struggle. Spaces are often small, and budgets are likely tight. DIY can be a lifesaver. But if you’re like me, and woodwork sessions at school consisted of soldering random things and making a CD rack, you may feel like you’re up against an impossible task. Necessity has caused me to have to learn the basics of DIY to be able to live alone, and actually have some furniture. So if you’ve moved into your first home and have some basic DIY to do here are some tips I hope will help. 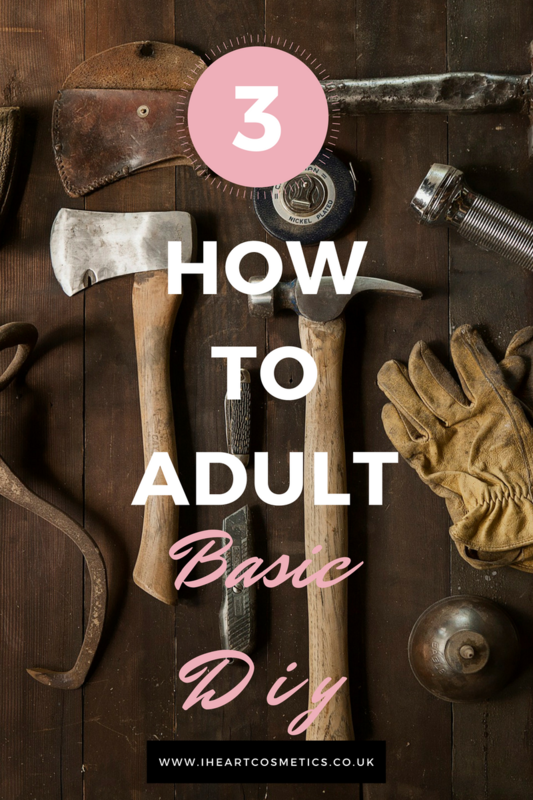 The first step is to purchase a basic tool kit that you can use to put together furniture, fix simple things and hang pictures. I don’t really recommend buying any of those cheap ‘all in one’ tool kits. The quality is usually terrible. Just buy a couple of bits as and when you need them. You could keep yours in a bag or a box but keep them all together so you don’t lose anything. The first few times you make furniture, especially if you are not the strongest person and have to do it by yourself, can feel incredibly long and frustrating. Just hang in there! Consider gluing areas that are going to be used on a regular and daily basis, i.e. the groove which the drawer bottoms sit in/ wooden dowels that hold the drawer front in place. You can use PVA wood glue for this or carpenters glue. You can get them anywhere like Homebase or B&Q. It will only take a small amount of time but will be worth it to have solid furniture that will stand the test of time. Use a spirit level to ensure that the item is properly square/flat when complete. Sometimes there is just a random hole in the item where it shouldn’t be….nobody knows why, it’s not just you. Making Flat Pack Sounds Too Hard? If you really can’t do it yourself and have nobody to help you there is an answer. It’s not the cheapest but sometimes if you can’t do a job you have to call in a professional. You can use a service to get people to come and make it for you. I am not going to recommend any specific company as I have never used one myself but just google ‘flat pack assembly’ and the town you live in and try and find reviews. There seem to be quite a lot of these available all around the country now. One of the most boring jobs of all time and one involving a drill, so don’t do it in the middle of the night or your neighbours will despise you. The most important thing is buying something called a wall detector. It detects where is safe to make a hole in your wall and can be purchased at any DIY store. While they cost around £30 it will last a very long time and mean you don’t cause damage to your home. You should always be sure that it’s safe to drill before doing so, A detector helps to locate live electrical cables as well as wall studs, steel framework and non-ferrous metals such as copper piping. Things you do NOT want to try and drill through. You don’t need a leak or to electrocute yourself. I’m going to go ahead and assume you want to put up a curtain pole rather than those old plastic tracks. You know, since we aren’t in the 80’s any more. Curtain poles come in metal, wood or plastic. The curtains hang from metal eyelets, rings or loops of fabric. You can adjust the length of some curtain poles, and I recommend getting an adjustable one. I made my curtain pole wider than the balcony doors and it really helps block out more light. Think about the curtains you have bought/want to buy. If you want to hang very heavy curtains ensure the wall is plastered well and you may have to use longer screws than the ones you get with the pole in the pack to hold it in securely. Or just go for fairly light curtains! The end brackets for your curtain pole should be at least 50mm from either end of the window recess. Mark the positions for the two end brackets with pencil and then check they’re level with a spirit level. Then using your detector check that there are no wires where you have marked. It’s unlikely there would be next to a window but best to check! If all is good, mark where you need to drill with the pencil and drill the holes using a masonry bit. Insert some wall plugs as a normal screw will not securely stay in plasterboard or masonry without a wall plug. It’s plastic and will expand to securely grip the sides of the hole you have drilled, it’ll hold the screw in place without damaging your walls. Then screw the brackets into place. If you plan on fitting tie backs to hold the curtains when they are open, do this after the curtains are hung so you can guage the placement better. As with my other ‘how to adult’ guides this is just a simple and basic overview. topics you would like me to cover.